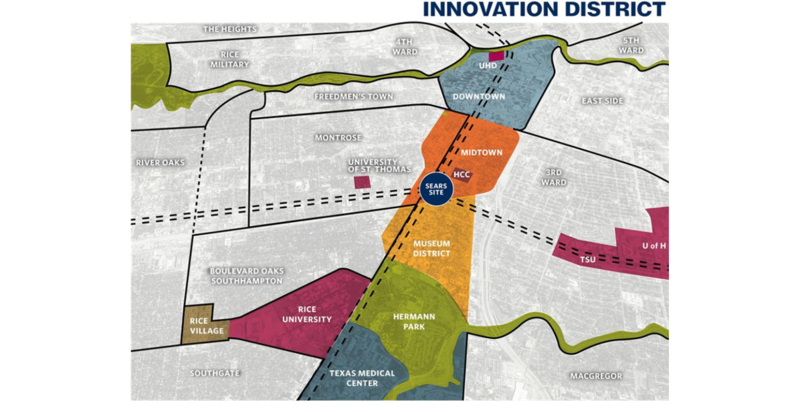 ​​​​​ HOUSTON – Private and public officials finalized a deal in early April 2018 to develop the main campus of Houston's innovation district at the site of the former Sears location in Midtown. Located at 4201 Main, the Sears site is a 2.5-acre tract valued at just over $6.2 million. The campus is expected to act as the heart of what will serve as Houston's innovation corridor. The Rice Management Co. owns the land, and Rice University is the innovation district's sole equity partner. Rice University is preparing to invest up to $100 million in the roughly 24-month development of the district.